Kids love water. If you need a minute to yourself, fill up a bucket with some water or turn on a faucet and pull up a stool and you’re golden. 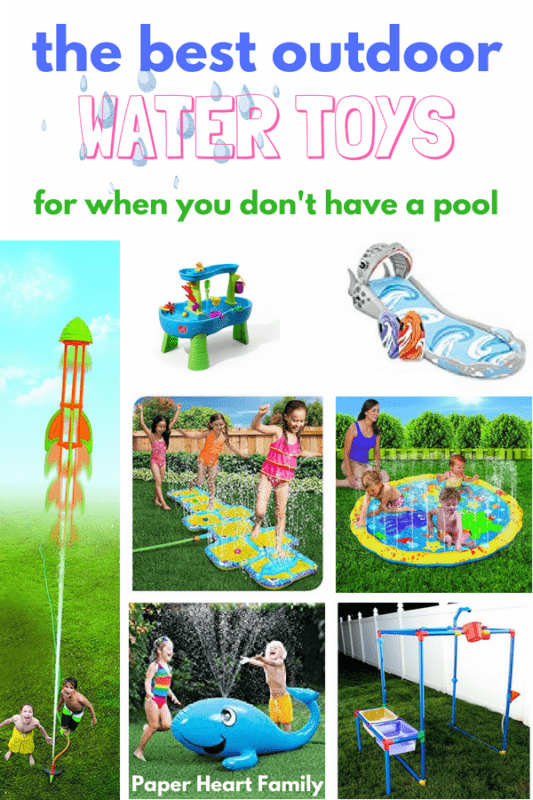 Or you could check out the best water toys for kids list that I have for you here. As a kid, some of my best memories deal with water. I remember swimming in the stream at our family cabin and swimming in the pond behind our property. I also remember going to my grandmother’s house. She didn’t have very many toys, so she always gave me an old fashioned egg beater and set me up with a bucket of bubbly water. Instant water toy. That was all I needed. And who remembers this water toy? Come on, children of the 90’s! It was called something different though, wasn’t it? Someone please tell me in the comments because mom brain. Water toys really are the best. They are fun, memorable and many times educational. This list contains the best outdoor water toys for toddlers and older kids, too. These are some favorite indoor water toys and outdoor water toys that kids love. My toddler LOVES playing with a spray bottle. There are so many different things your child could do with it. Mix in some food coloring and make art or play Spray Tag. We did It’s Always Autumn’s Tissue Paper Art. It was so easy and a huge success with both my kids. Whenever I steam the hardwood floors, I give the girls a bucket and rags and they clean the floor right along with me. It never gets old. This is such a brilliant DIY activity that you can do at home. Create a castle out of ice cubes or sand castle molds. My 2 year old loves her baby dolls, so I bought her this doll tub for Christmas. She loves washing her dollies. It actually sprays water, and even my 2 year old has no trouble pumping it so that it will spray. My kids have this and it gets played with frequently. When I was a kid, I used my trash can from my room as my Barbie’s pool. Yeah, seriously. This one is a little more upscale. We have (and love!) this bath toy. It works so well and never seems to get old with my kids. If your kids like having the faucet on all the time, then you NEED this toy. It’s also a go-to gift of mine for younger kids. My daughter is obsessed with fish. This is a great bath toy to foster a love of fishing (if you’re into that kind of thing). It comes with a fish that moves to simulate the actual fishing experience. How cool does the Step2 water table look? With an interactive waterfall and many moving parts, it’s sure to entertain. I’ve never met a kid who didn’t love the Stomp Rocket. When I saw the water version, I knew it would be an instant success. This is so much fun for everyone in the family. Every kid needs a pool, right? We have this one and it’s perfect for the little ones, complete with a ball toss, two sprinklers and an inflatable slide. I’ve seen a lot of DIY versions of this on Pinterest, but if you’re not into DIY or don’t have the time, this is an inexpensive and pretty awesome alternative. All you need is a tarp and some pool noodles to make this awesome splash pad for your own backyard! If you’ve ever (tried to) fil traditional water balloons, you’ll understand why these are brilliant. Fill 100 balloons instantly or spend an hour cursing about how you should have bought this. Hopscotch is great for kid’s balance and coordination, and this water hopscotch game with have them practicing over and over. These can be found at the dollar store. They’re way better than water guns in my opinion, and they are easier for little hands to control. The splash mat is perfect to keep the little ones cool this summer. It’s also way easier to maintain than a kiddie pool! How cute is this whale sprinkler? I could see this being a cute addition to a kiddie pool. Everyone has a hose laying around, and believe me, handing it over to your kids could provide for hours of entertainment. They can “wash” the cars, water the flowers, jump over the spray, etc. This is the simplest activity, but kids love it because they get to transfer water from container to container, and get wet all at the same time! Looking for free outdoor activities? Check out these unique, cheap summer activities. What are your kid’s favorite water toys? Amazing idea. Kids love to play in the outdoors. I like this water toy for toddlers. In hot summer kids must like it. I feel relax and comfortable to play with water toy. Thanks, Marria! I hope you were able to use some of the ideas with your own kids!